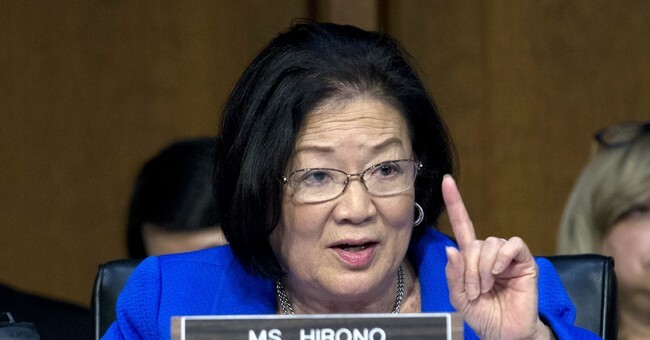 Sen. Mazie Hirono (D-HI) announced Wednesday that she has cancelled a planned meeting with President Trump’s Supreme Court nominee, Judge Brett Kavanaugh, in light of former Trump lawyer Michael Cohen’s guilty plea and testimony. “This president who is an unindicted co-conspirator in a criminal matter does not deserve the courtesy of a meeting with his nominee, purposefully selected to protect, as we say in Hawaii, the President’s okole,” she said, employing a crass, colloquial Hawaiian term. Former Trump lawyer Michael Cohen pleaded guilty Tuesday on multiple charges and faces up to five years in prison. He told the court that he violated campaign finance laws in the arrangement of payments to Stormy Daniels and Karen McDougal, saying he’d violated federal law "in coordination with and at the direction of a federal candidate for office," in an apparent reference to President Trump. President Trump has since responded by dismissing Cohen’s guilty plea as related to campaign finance violations that are “not a crime” and comparing it to a campaign finance violation that was settled by the Obama administration. Hirono is not the only one looking to delay Kavanaugh’s confirmation hearings in light of the news. Several of her Democratic colleagues in the Senate have released similar statements. After bombshell convictions of key Trump cohorts—& identification of President Trump as an unnamed, unidicted co-conspirator—Judiciary Committee must postpone Kavanaugh nomination hearing.